I love having people over to my house for dinner and conversation. It just is so much more intimate than a restaurant. And as I get older, the hearing isn't as good in loud environments. Too much gets missed. I have one amazing group of 7 couples I try to have over once a year, but with everyone's schedules it is tough. It had been 18 months since our last full get-together. 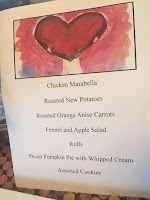 Finally this week it happened and as soon as I learned it was a go I dove into menu planning. For larger get-togethers, I try to pick recipes where almost everything can be cooked or prepped the day before so my time after they arrive is relaxed. 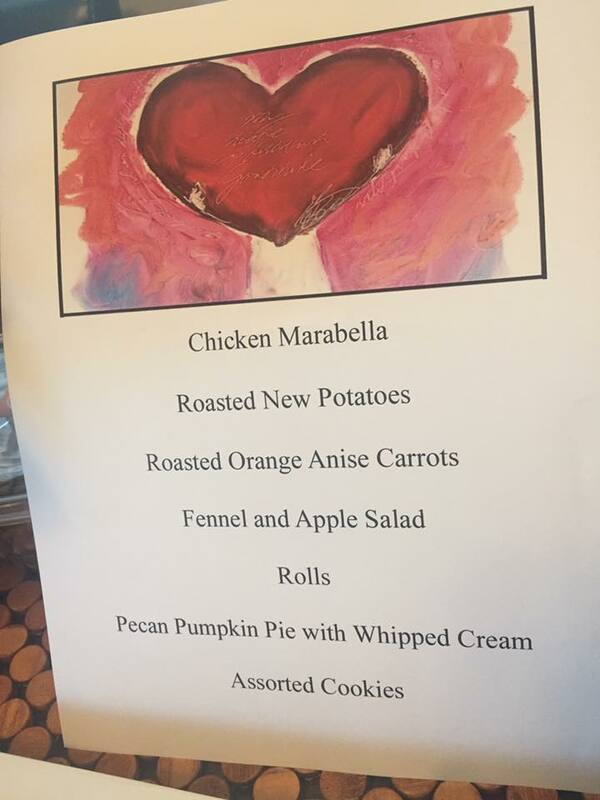 This time, I chose a menu of Marabella Chicken, Roasted Orange Anise Carrots, Roasted New Potatoes, Rolls, assorted cookies and Pumpkin Pecan Pie (made even easier by using a purchased crust). this pic of my menu. All was in prep the day before when I felt I needed one more item, a crispy salad that would not wilt. I decided the base would be Fennel and after exploring lots of options settled on this one where the fennel is paired with tart Granny Smith Apples. I tripled the recipe as it only serves 4 and we had 13 in total, and I left off the walnuts to fit in better with the other dishes. It was the prefect companion to all the cooked dishes. I'll be making it again. 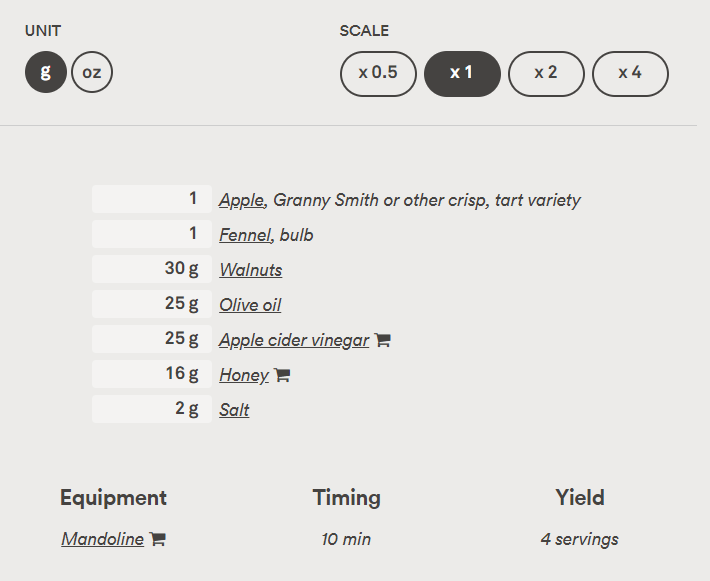 This recipe came from a site called Chef Steps. I've put their instructions below with what I did personally in parenthesis. Enjoy! I tripled this for my large crowd, so instead of 4 this makes 12 servings. I have the chart showing the original proportions below. Adjust your mandolin to slice at a thickness of 2 mm (I just used a sharp knife and a cutting board and before slicing I cut the bulbs vertically into quarters and the apples into eighths). 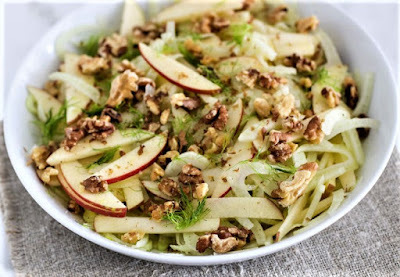 Slice fennel bulbs and apples crosswise and mix with nuts in a big bowl. Combine olive oil, apple cider vinegar and honey. Pour over ingredients in bowl and sprinkle with salt. Combine well.